Sale of the First Bank in Decentraland (MANA)! Today, there was the first announcement about the sale of land with the first bank in the new crypto world at country Decentraland. 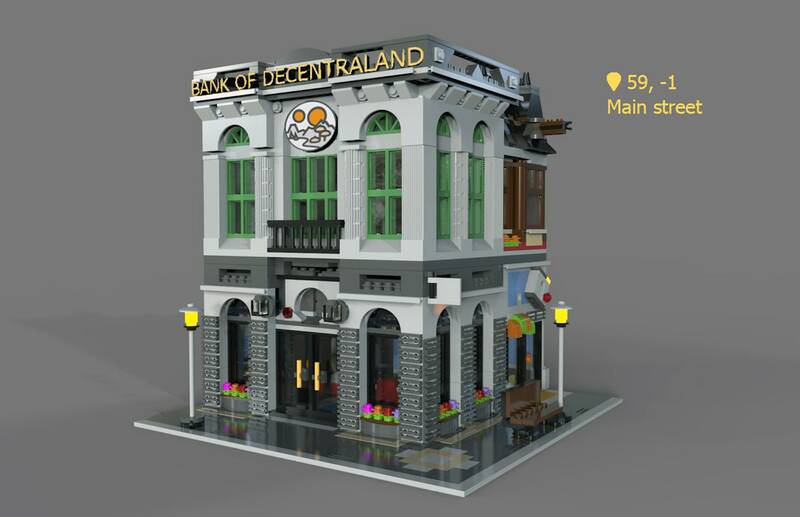 Bank of Decentraland Corporation (BofD) with location: 59,-1 (BofD) is an Decentralandian multinational investment bank and financial services company based on Main Road at Decentraland. Decentraland is a decentralized virtual reality platform powered by the Ethereum blockchain. Within the Decentraland platform, users will be able to create, experience, and monetize their content and applications. The finite, traversable, 3D virtual space within Decentraland is called LAND, a non-fungible digital asset maintained in an Ethereum smart contract. Land is divided into parcels that are identified by Cartesian coordinates (x,y). These parcels are permanently owned by members of the community and are purchased using MANA, Decentraland’s cryptocurrency token. This gives users full control over the environments and applications that they create, which can range from anything like static 3D scenes to more interactive applications or games. In these recent, heady times of volatility in the crypto markets, Decentraland has served as a haven for digital real estate. It appears that, as in the real world, in the virtual world real estate is also one of the safest investments. There certainly is something of a rush going on at the moment, with whales trying to hide from this month’s land market buying over $500k worth of Decentraland’s LAND parcels in the past 5 days. Many of these whales have opted for the strategy of buying up as much cheap LAND as they can, and then investing in patches of more high-value LAND across the map. This fast-paced land rush has encouraged smaller buyers to get in on the action too, before all the LAND gets snatched up by whales. Take a look at the transactions on Etherscan. Why the sudden feeding frenzy when it comes to virtual real estate? It may be that the disappointing bear markets of 2018 have a lot of investors thinking their investments might never reach the astronomical highs of late 2017. They might be looking to diversify their portfolios in something less risky than Bitcoin, that they can build on in the future. Decentraland certainly has a lot of potential in that aspect. To learn more, check out The Guide to Buying Decentraland Parcels (LAND). This press release is based on the article Whales Migrating to Decentraland – $500k Land Sales in 5 Days by DCL Plazas.